You know that I am a feminist. Child care, nappy changing, shopping, washing, cooking, I dxo more than my fair share. But there are some things that only women can do. Breast feeding for example. 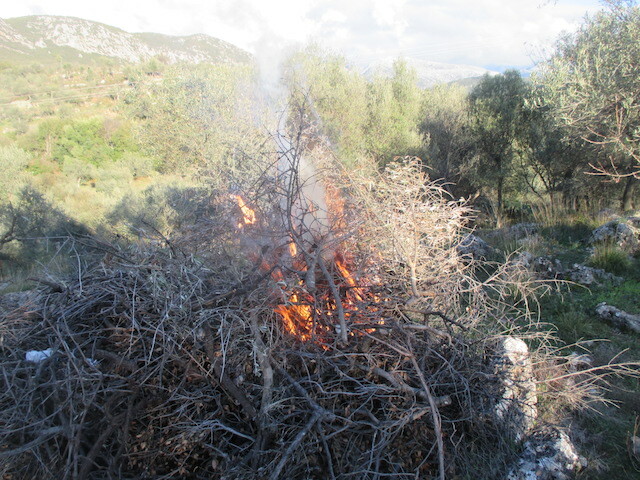 And there are some things we men do: snake killing, ouzo drinking and.. lighting fires. My repeated failure to burn off the olive branches and frigana I cut down last year at the Greek Hovel has thus been somewhat emasculating. And it got far worse yesterday before it got better. 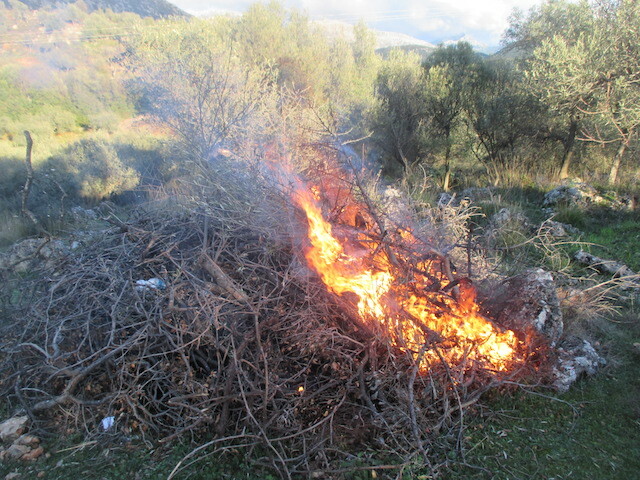 After meeting George the Architect I tried again to create a bonfire. Sure, lawyers letters from Roger Lawson went up in smoke but nothing caught. I retreated to my nearest village of Kambos disheartened. On my way down snake hill I saw a roaring blaze in a field by the side of the road. That was bad but worse still was that it was being tended by its author, a fair maiden of the olive groves, a woman. FFS that really was a kick in the gonads. Thus after lunch at Miranda's - an excellent calamari cooked in a sardine based sauce and some mountain greens boiled and doused in lemon for 7 Euro since you ask - I determined to return to the hovel for another go. 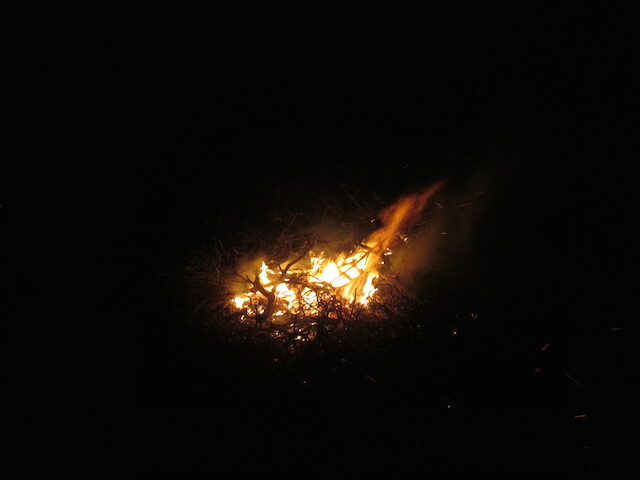 Running out of Lawson's letters I started to use empty concrete sacks to set the pyre on fire. Occasionally one took but then spluttered and faltered as you can see below. Almost despairing as the afternoon wore on and the air started to chill, I resorted to the traditional methods of using a handful of long grass to set the fire going. It was still a bit wet but there seemed hope. But hope turned to despair after several more failures. 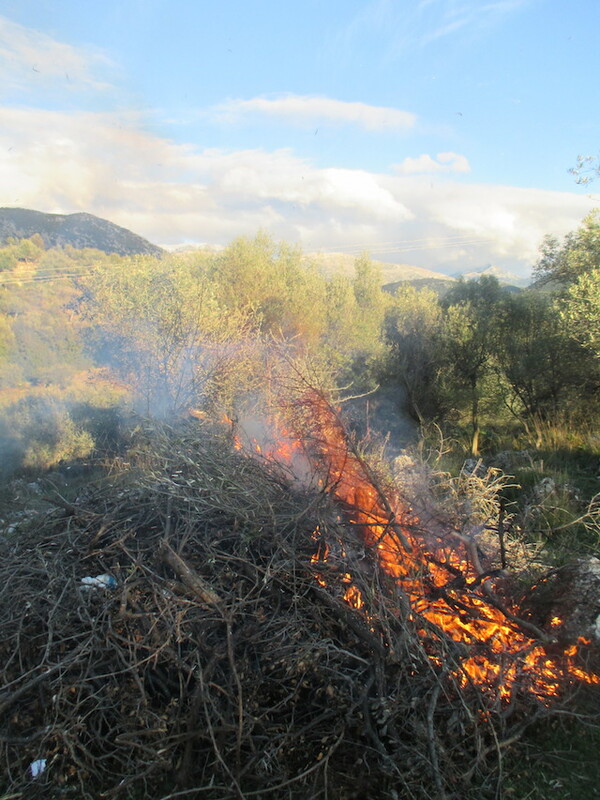 One last try thought I and picking a huge bundle of grass and adding in some twigs I set it alight and plunged it into the heart of an enormous pile of rather damp branches, twigs and dried frigana leaves. Alleluliah! The Lord rewards those who persevere and something caught. Very soon I had a real blaze going so big that I am sure my neighbours on hills miles away must have seen it. They won't be laughing at me in Kambos anymore thought I. 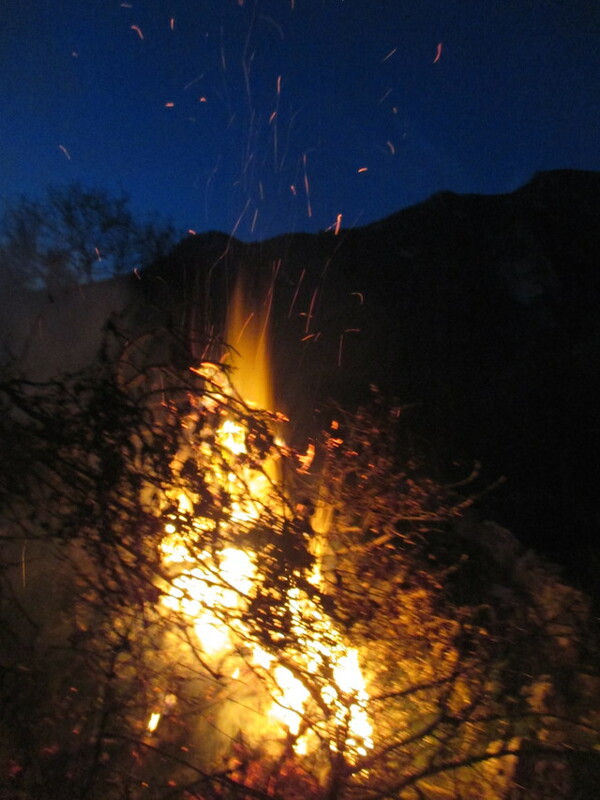 As you can see below, pretty soon darkness was closing in but I wanted to stay until the fire was done. 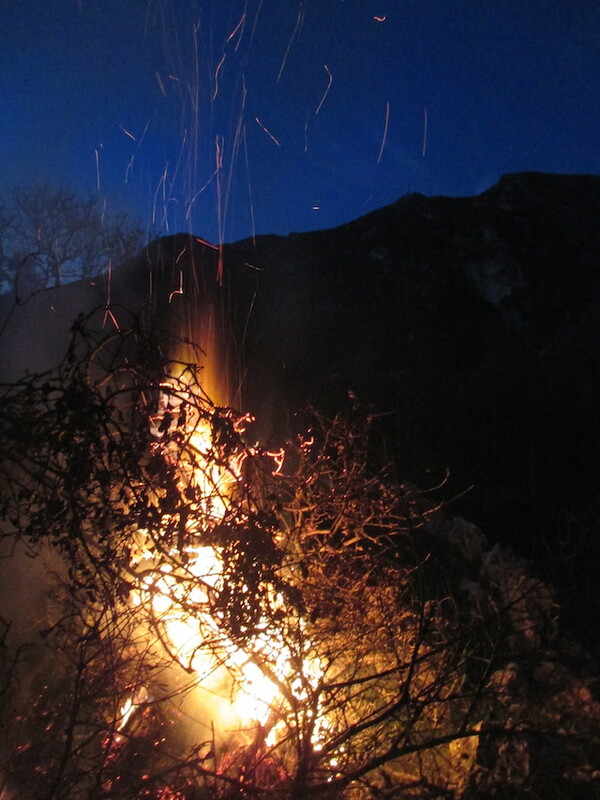 Flames reached up into the night sky. And before long I turned around to stare into a pitch black sky. I could see nothing at all, not the hovel not even my car fifteen yards away. 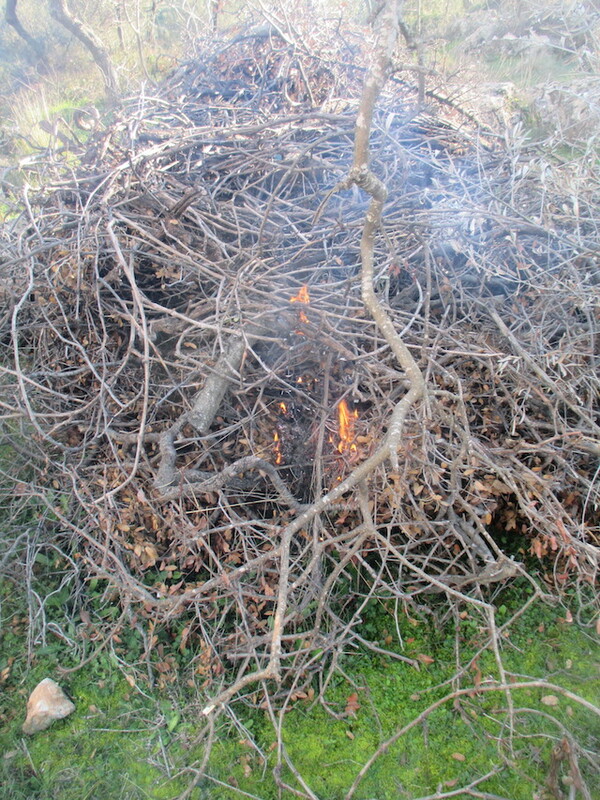 But I worked on, not leaving until the whole pile was gone and the flames were starting to turn to embers. I was not back to my hotel until nine O'clock. I spoke to the Mrs about how I felt that my manliness mojo had been restored and she told me that I was talking complete nonsense. But I am sure that if you are a man you know what I am talking about, don't you?